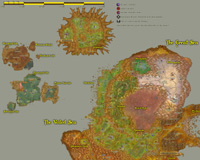 The following are maps of the world of Azeroth, for use as a resource for GMs running the World of Warcraft RPG. 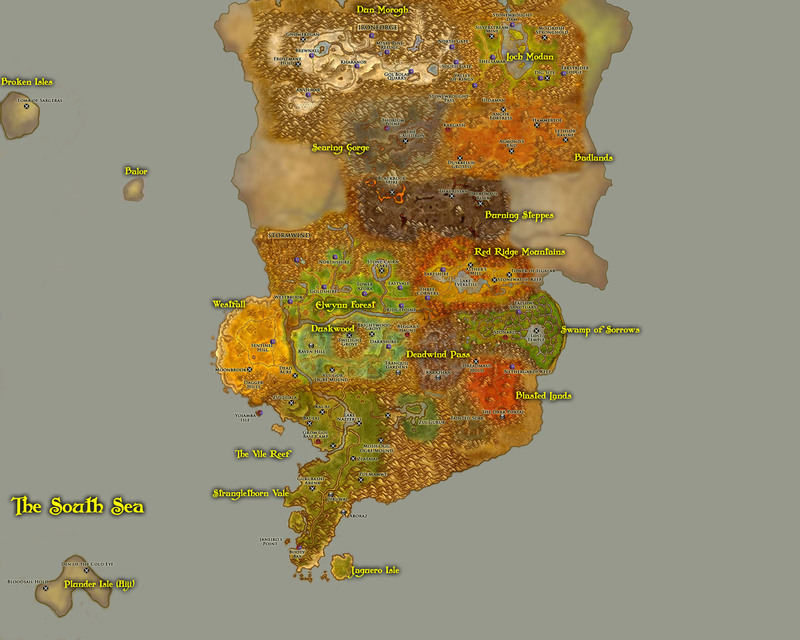 These maps are cobbled together from various (often conflicting) sources, and hence arbitrary decisions have been made to reconcile the inconsistencies. More details are at the bottom of this page. The following are rough travel times to use in conjunction with the map below. For more detailed overland travel times, please consult the Dungeon Master's Guide, or the System Resource Document. Foot (Spd 15') 12 mi 1/16"
Wagon Carvan 16 mi 1/12"
Walking (Spd 30') 24 mi 1/8"
Walking (Spd 40') 32 mi 1/6"
Horseback (less than 150 lb load) 48 mi 1/4"
If printed off at 300 dpi and taped together (with significant overlap), this map should have a scale of 1" = 192 miles (4 days by swift mount, 8 days by foot). Please consult the Dungeon Master's Guide or Open System Reference Documents for details on overland travel times. This travel map was pieced together in similar fashion to the Kalimdor map, though I started with a "zone map" I found during a Google search, and then I proceeded to make alterations from there (pasting in a few of my own "zone maps" to scale things how I wanted, adding labels, adding icons, and drawing in missing islands and the nation of Zul'Aman). Although I tried to add some outlines for greater clarity, there are several "faded" areas: These represent areas part of the continents of the Eastern Kingdoms that aren't actually covered by game-playable "zones" in World of Warcraft, or they represent areas that I've added in (Kul Tiras, Zul'Aman, and assorted islands) that weren't covered by the World of Warcraft maps. 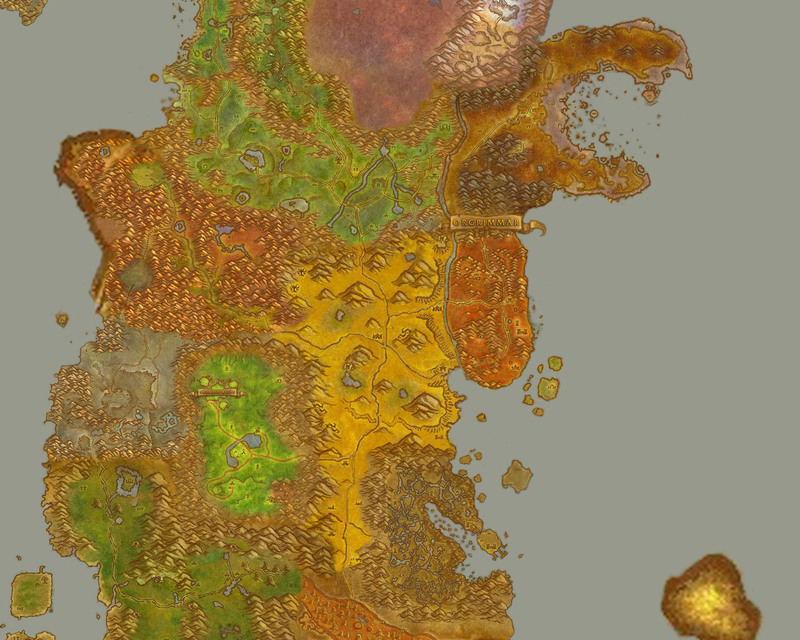 As with the Kalimdor map, this is presented in three pieces meant to be printed off at 300 dpi (8"x10" print area), and there is some overlap. I've also gone the extra step to add in some dots to mark certain major locations indicated on the maps and to give an indication of what "faction" they belong to. 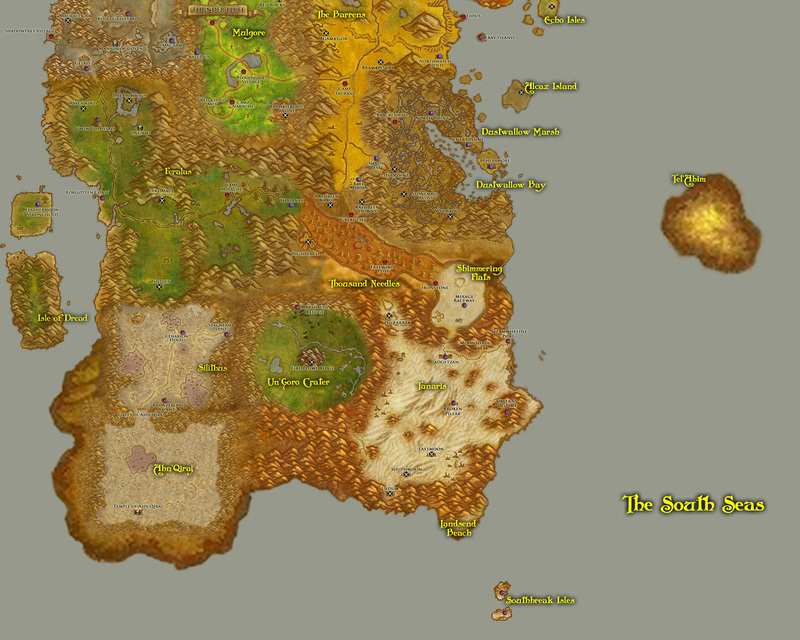 One resource sadly lacking from the roleplaying game (as per this writing) would be any detailed information on the size of the lands of Azeroth, and travel times to get from one place to another. 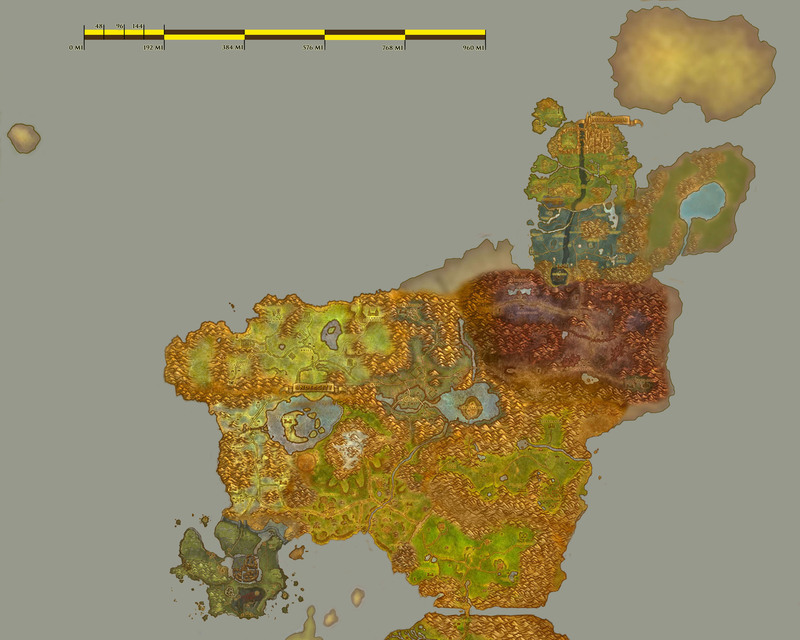 For my own campaign, I've tried to develop some maps and other resources to assist in determining travel times. 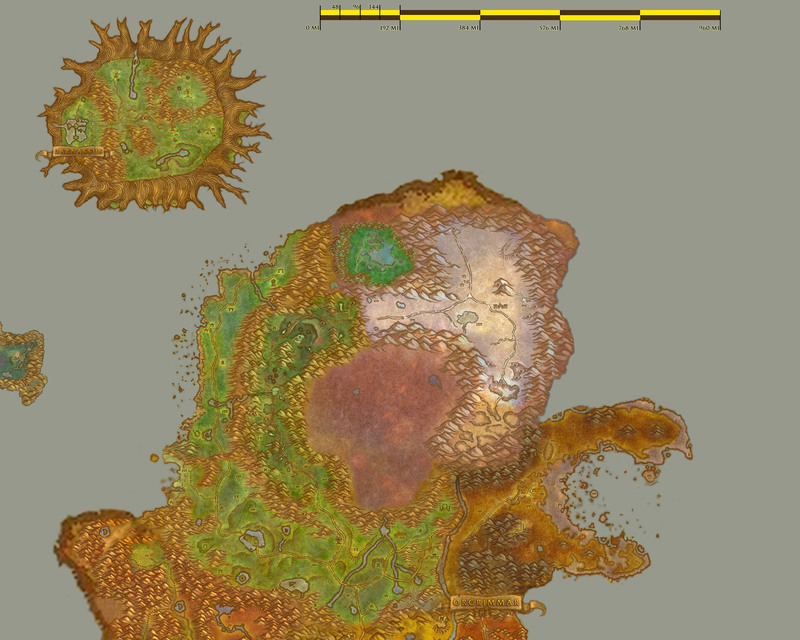 These aren't very "pretty," as they're hacked together from screen captures, with a bit of touch-up work based on various alternative sources. However, I hope that this might provide a starting point for GMs running broad "overland" campaigns. Please note that, out of necessity, I've made a lot of arbitary assumptions, filling in various gaps. 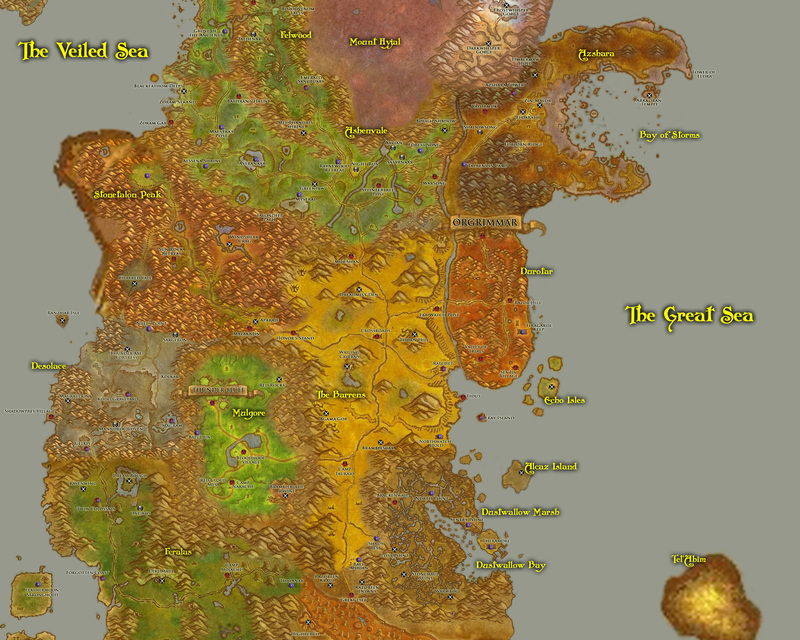 The scale of the maps is based upon a tidbit of information from the White Wolf Forums, that Kalimdor is approximately 1600 miles across, east to west, at its widest point. 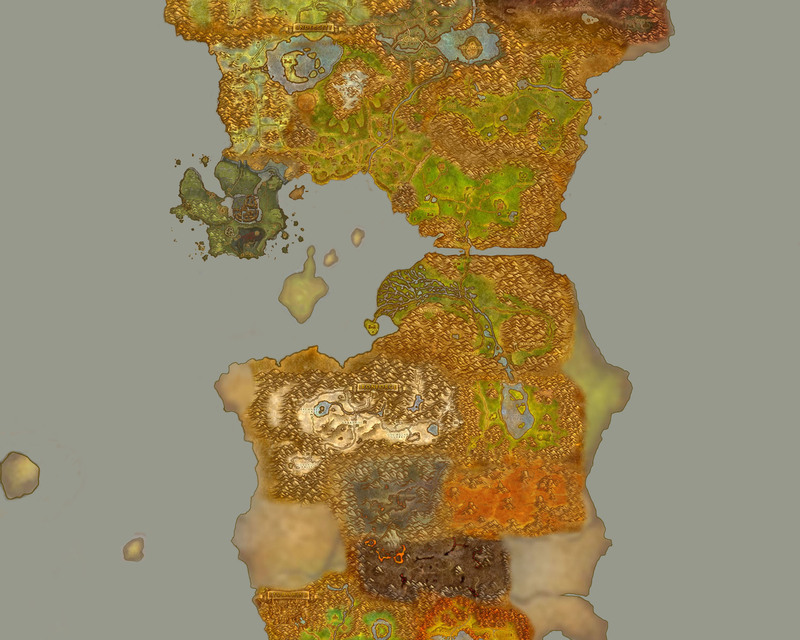 From that piece of information, I've extrapolated the rest for my maps. The d20 System� is a trademark of Wizards of the Coast, Inc., a subsidary of Hasbro, Inc. in the United States and/or other countries. The d20 system and all related terms are copyright � Wizards of the Coast. 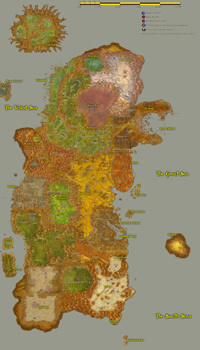 This site is in no way associated with or endorsed by Wizards of the Coast, Inc. or Hasbro, Inc.
All other original artwork on this site, not otherwise a property of Blizzard Entertainment or Wizards of the Coast, unless specified otherwise, is copyright � T. Jordan Peacock (aka "Jordan Greywolf"). 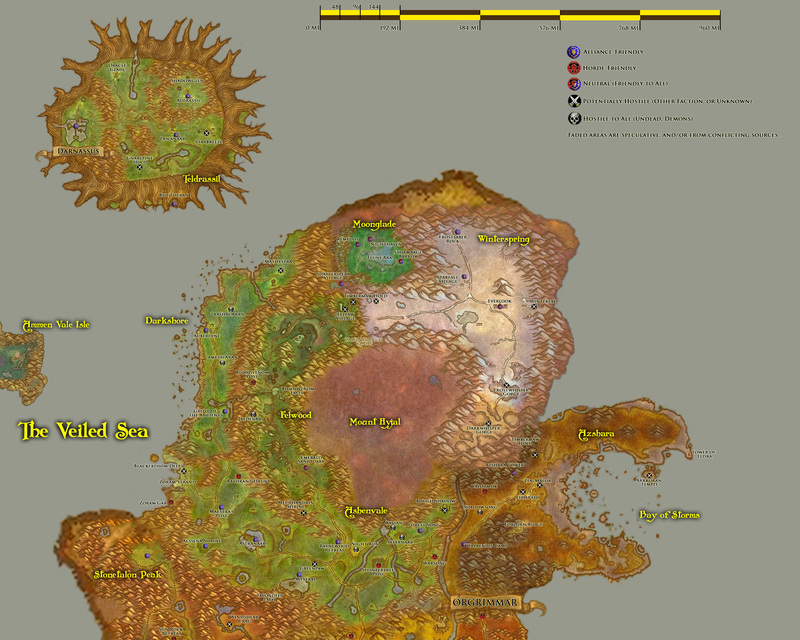 The map images on this page, however, are put together from images from the World of Warcraft� game, created by Blizzard Entertainment�. They are not original artwork created by myself, and I do not claim copyright on them, since they are derivative works, though they have been significantly altered from their original form.